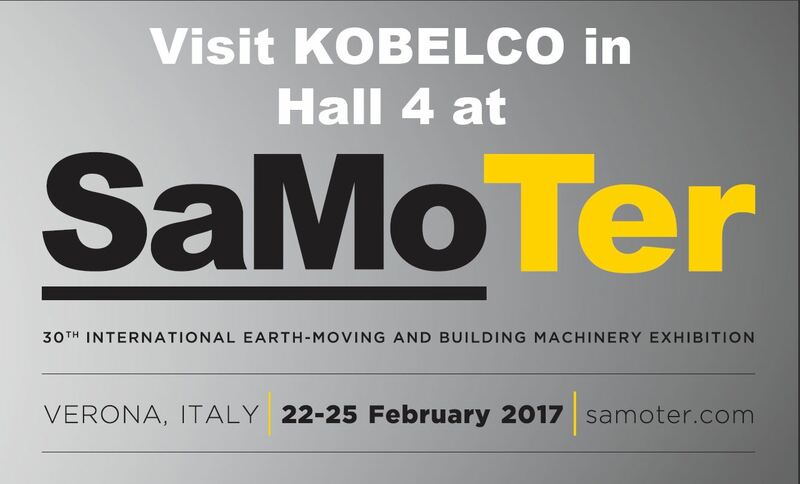 Kobelco Construction Machinery heads to SaMoTer 2017 - Kobelco Construction Machinery Europe B.V.
Kobelco Construction Machinery Europe B.V. (KCME) is committed to providing industry-leading construction equipment and is looking forward to showcasing its latest models at SaMoTer in Verona on 22-25 February. The manufacturer’s attendance at this year’s event is particularly important as it recently announced the appointment of four new Italian dealers, marking its entry into Italy. SaMoTer is Italy’s leading construction exhibition and 2017 is its 30th anniversary. Taking place every three years, the event welcomes more than 450 exhibitors from the construction industry as well as more than 40,000 visitors from over 50 countries. KCME is keen to use the event as a platform to introduce the Kobelco brand to the Italian market. The SK55SRX-6 is one of the latest mini excavators to be launched to the European market. Powered by the latest generation Yanmar engine, this machine commands maximum performance while still meeting stringent emissions regulations, and can deliver up to 23% reduction in fuel consumption. The SK85MSR-3 with two-piece boom enables operators to work across a wide operating range while still providing smooth hydraulic operation, high performance and increased fuel efficiency. This model is ideally suited to compact jobsites as its adjustable boom enables more digging space within the same area. The new SK180N-10 promotes excellent working performance and fuel efficiency and is ideal for mountainous or remote areas where the working conditions are particularly tough. The machine’s narrow carriage track of just 2,500mm also enables easy transportation. One of Kobelco’s largest models, the SK350NLC-10, leads the way in class thanks to its exceptional low emissions and reduced operating costs. The machine’s enhanced durability means that it can withstand the toughest terrain and working conditions and is well suited to applications such as demolition, general excavating and quarrying. In addition, visitors to SaMoTer will be able to see the SK17SR-5, SK18, SK28SR-6 and SK35SR-6 mini excavators, the SK140SRLC-5 and ED160BR-5 short radius machines and the larger SK300LC-10 excavator on the stand. Visit us at SaMoTer in Hall 4.